Former marathon world record holder Haile Gebrselassie has given up on his dream of competing in London 2012. The Ethiopian, who turns 39 on Wednesday (today), was a two-time Olympic 10,000m champion before switching to the 26-mile distance in 2004. But he has been unable to win a place in Ethiopia's Olympic marathon team. The athlete suffered a setback in his bid to qualify for London 2012 by finishing fourth in Febraury's Tokyo Marathon with a time of 2:08.17. Eighteen of his compatriots have clocked faster marathon times this year, which left the veteran with an uphill battle to earn his place. 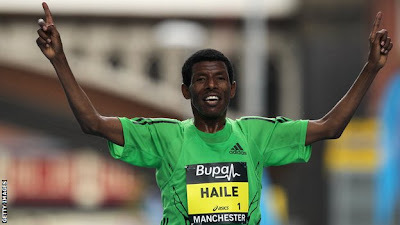 Gebrselassie insists he will continue to run long distance and has confirmed his participation in May's 10k Great Manchester Run, which he has won in each of the last three years. Last weekend he beat Britain's Paula Radcliffe in a head to head half marathon dubbed the "Emperor versus the Queen" race, in Vienna. Gebrselassie, who gave a head start of seven minutes 52 seconds to Radcliffe in the 13.1 mile race, finished in 1:00.52.